Its March. The sun has already started to prove its dominance. Gone are the days when Bangalore used to be one of the best places in South India to spend the summers. With the scorching heat, traveling is a distant dream let alone scaling the hills around Bangalore. 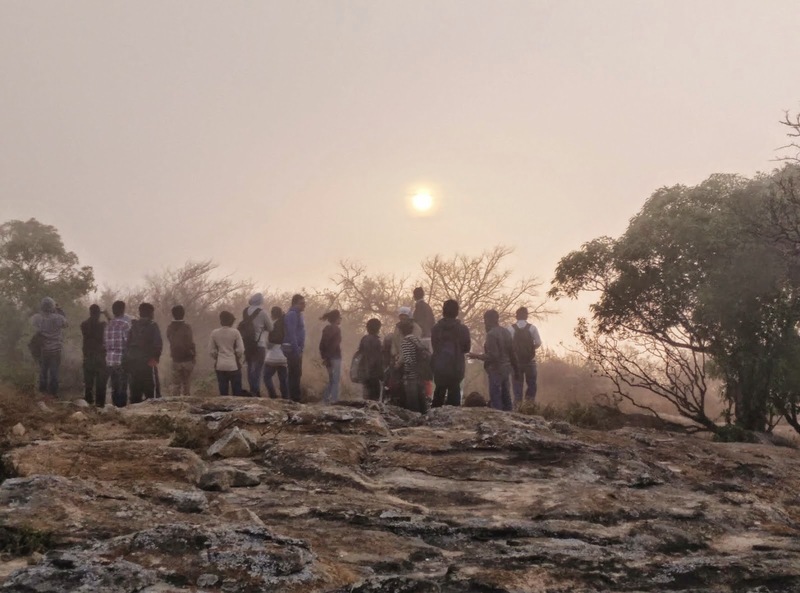 There comes BTC (Bangalore Trekking Club) with a night trek "Night trek to Horagina Betta". When I was almost determined to take this, comes another one again from BTC "Night trek to Makalidurga". Reminded me of the Dairy milk shots ad "Mann mein 2 ladoo phoota kya". BTC treks are so famous that the registrations closes within hours. Its like booking tatkal tickets in IRCTC (Not a good analogy though). I had to take a very quick decision. Googled both Horagina and Makalidurga and decided to trek Horagina. The day arrived. Started from my home and lost all my energy reaching Majestic. (Needless to say about Bangalore traffic combined with the summer). Still unclear about how I will be able to trek and spend the whole night on a open hill top, I get introduced to the people waiting over there. Boarded a bus and sleeping through the journey reached Nandi cross. After a funny and bumpy auto ride reached a small food outlet. Ordered evening snacks and everyone hogged on them ready to start the trek. We started our trek around 8pm surrounded by darkness and eerie silence. Everyone was excited and was enjoying the star filled skies and the unpolluted breeze. The organizers did a very great job in finding the trail even in the darkness. Taking frequent rests, we reached the hilltop around 10:30 pm. Potluck on a open hill top with a new set of friends fighting with each other for the last piece of food. Contented with the dinner, we went in search of wood to light the camp fire. Started searching for twigs, we ended up with huge branches ready to be fired and survive the whole night. The weather was getting colder and stepping out of the camp fire was nearly impossible. Played the dumb charades and then the usual antakshari with hindi songs interjected with few Tamil songs. Few people called it a day and cuddled into their sleeping bags. I envied those people for being full prepared but the night was still young and was to be enjoyed rather than sleeping. Then came the most interesting part of the night. "The Confessions". Everyone shared an interesting story from their lives and mostly it was bachelors stuff. Thanks to the two women in the team who went to sleep, we had lots of boyish conversations. Also came few interesting things like hitting a police inspector and getting arrested, a swayamvar story ending in tragedy with the girls parents rejecting the boy twice though the girl was in love with this guy. Time for a coffee break. Started preparing coffee in a innovative fashion, making a creamy coffee syrup and then mixing it with the milk. Much needed coffee and felt Starbucks should learn from us on how to brew a coffee. Around 5am in the morning we are surrounded by clouds and mist. Remembered the heaven sequences in mythological dramas/movies. The sun started rising faster and it was a helluva view. Time for selfies and profile pictures. Wished this moment never ends but then it was time to trek down. Reached foothills, had breakfast and started the journey back to our homes bidding goodbye to the newly made friends.